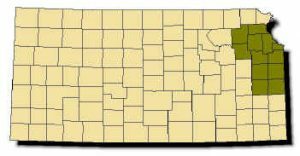 Range: Restricted to northeastern Kansas along the forested ridges of the Kansas and Marais des Cygnes river valleys and their tributaries. Description: Harmless. Smooth scales on front of body; weakly keeled scales on rear. A plain colored snake; body is brown, gray or reddish brown with tiny black spots or flecks. Six scales on each upper lip. Belly is white, cream-colored or light yellow. Young look like small adults. 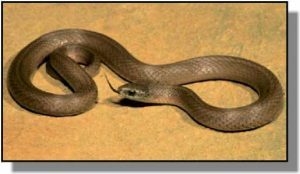 Habits: This small snake is active from April to October in moist forests, with ample rocks, logs or leaf litter under which to hide. It breeds in spring or fall and gives live birth in late summer to 2-14 young. Never bites. Like many other small woodland snakes, it eats earthworms, slugs, and soft-bodied insects.